Rising crude oil prices and higher inflation expectations are likely to create upward pressure on interest rates in 2018. With MPC members expressing concern over rising prices in the recent RBI policy review, the rate cut possibility appears unlikely in the near future. Moreover, shortfall in government revenues along with disproportionate increase in expenditure has put pressure on bond prices. With government planning to raise Rs 50000 crores through g-secs, it will create additional supply of government bonds that will put upward pressure on yields. The bond yields are rising since Aug'17 with yield on 10 year g-sec increased by almost 100 basis points between Aug'17 and Jan'18. It was 6.4% in Aug'17 with current yield at 7.4%. Bond yields and prices have an inverse relationship. Bond yields go up when bond prices fall and vice-versa. For example, if government issues a Rs 1000 face value bond at a coupon rate of 8%, its price will come down to Rs 800, if interest rates/yield goes up to say 10%. This is because at 10% rate, the bond with face value of Rs 800 will fetch same interest payment of Rs 80 that a Rs 1000 face value bond fetches at 8%. On the other hand, if interest rates/ yields falls to say 6%, the price of the government bond will increase to Rs 1333. As the old bond prices get adjusted to the changes in yields/interest rates, it affects the holdings of debt mutual funds. Increase in yields reduces the NAV of such funds which negatively affects the returns. 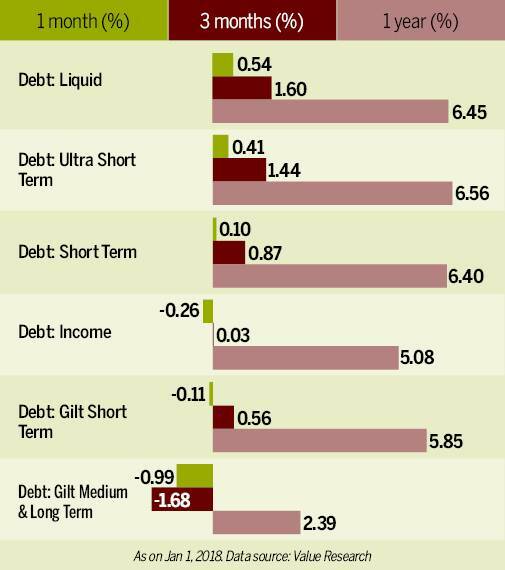 As the yields goes up, long term debt funds are exposed to the duration risk. Duration risk is the possibility of capital losses due to increase in yields. Such risk is more prevalent in funds that hold long term bonds or g-secs as compared to short term funds. This is because, returns of long term debt funds are derived mainly from the bond prices while the remaining comes from the coupon payments. On the other hand, returns on short term debt funds are mainly derived from the coupon payments and rest are derived from the bond prices. Long term bond yields factors in future expectations of inflation, government finances, liquidity and therefore more volatile as compared to short term bond yields. Looking at the last 3 month returns, the long term gilt funds have delivered negative returns, whereas short term gilt funds, income funds have managed to earn positive returns. With rising inflation expectations and a larger fiscal deficit the interest rates are likely to remain stable or could go up this year. Although, long standing demand of a rate cut from the industry and the finance ministry will create difficulties in increasing rates. It is advisable for debt fund investors to re-balance their portfolio by moving from long duration funds to short duration funds. One can keep a check on the RBI's policy, country's economic growth, inflation and industrial production numbers to get a sense of bond market direction in the medium to long term.